When I was in the corporate world, we would do goal setting sessions for each year. Company, department and personal goals were laid out and had KPI’s (key performance indicators) attached to them. I could check in on a regular basis to see how I was tracking towards things I needed to achieve. Now that I’m home full time with my girls, I’m feeling a little lost. I decided that I would do some goal setting for myself. I don’t want the year to fly by, which it will, and be looking around wondering what did I accomplish. That is not to say that keeping two small children alive isn’t an accomplishment but I need something a little more tangible. Something to strive towards. I was brainstorming my list and I noticed a trend. All the things I wanted to achieve next year centered around deepening or detoxing in some form and it seems to be a great framework to work my goals into for next year. Goals don’t have to be crazy, following the SMART format has always worked well for me. It stands for Specific, Measurable, Attainable, Relevant and Time-bound. It helps set yourself up for success by giving your goals parameters so you don’t go too pie-in-the-sky. So thinking about the theme of Deepening and Detoxing, I came up with 3 areas in each category. Health – I want to continue my fitness journey and get back to running in addition to my classes at The Fit Mill. My goal is to run a race a quarter. I do well when I have something to train for and I would love to do another half marathon at some point next year. Blog – I want to continue to grow my blog and there are so many aspects that I feel I can continue to improve. I would love to learn more about photography and grow my network. I can do that through some online courses and plan to attend at least one blogger conference. Ultimately, I’d like my blog to be a source of income for us by the end of the year. Reflection – I want to get back into journaling but just the thought always seems so time consuming. I used to spend hours writing in my journals back in the day. Then I read about one line journals from Becca at With Love and A Little Self-Depreciation, I was sold and bought this journal. I love the simplicity of it and I love having 5 years to look at as a whole. I also plan to make time to read more. One book a month. It will force me to unplug a bit…see below. Digital – I need to put my phone down more. I’m entirely too attached to it – the social media, the constant news feeds, the interaction. So I’m going to set office hours for it and it’s getting kicked out of our bedroom. There are other things that I can fill my mornings with like a quick 5 minute meditation, writing or getting a workout in. I don’t need to see the news or my email right away – it’s all too depressing right now anyways. Diet – We eat a pretty clean and healthy diet for the most part but there is one area that I feel like I can personally improve on and that is my sugar intake. I want to start with the obvious and banish all those Christmas goodies to the curb immediately and then slowly get to the point where we are eliminating added sugar – even in the pasta sauces and ketchup that we buy. Clutter – I can’t stand clutter. I know it fuels my anxiety and hinders my ability to focus. Yet I still have areas of my house that drive me crazy because they just accumulate so much crap. Most of the time, I try to hide them but I know they are there, festering. I’m going to assign each month with an area that I’ve been avoiding. I’m a little bit old school and the type of person that needs to write things down in order for them to stick in my brain. 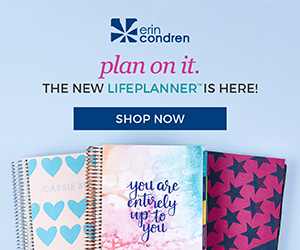 I’ve used an actual planner for the last two years, the Erin Condren Life Planner, and I like having a record of all the things that we’ve done, plus it keeps me organized. My favorite things about this planner are the personalization options, the week at a glance, the space for goals and all the fun accessories. They are colorful and clean and really help keep my visual brain on track. Not only do I write down what our plans are in the future but I also go back and write down things that we did so that I have a memory of special and even everyday moments. The links above are affiliate links but I truly have used their product for the last two years and love them. I don’t have a team or boss anymore to meet with on a regular basis so I’m going to hold myself accountable here. I promise not to bore you each week with all the things I’ve thrown out or if I ran but once a month I want to schedule a post where I need to fess up. Have you done any goal setting for next year? How are you going to keep yourself accountable? These are really great goals! I need to sit down and take a few minutes to set my own! Such great goals you have set. I really need to get myself organized for the 2018 goals. Thank you! It helped to jot down notes in my phone when I had an idea for next year. Or else I’d never remember what I want to accomplish. Mom brain. I like that aside from setting goals you also decided to do a detox. It’s good to make sure that we spend more time offline than we do online. It’s good to be in the moment! I honestly think that the digital detox is going to be the hardest part of that list…..well, maybe the sugar too. HA. It is good to get into the goal setting especially at this time of year. I think getting in shape and in the moment without a phone is a great start. Thanks! I think that fitness is a journey and this past year I was pretty successful getting back “in shape” after having our baby in January but it’s a lifelong journey I think! The digital detox is probably going to be the biggest challenge but it’s much needed. Goal setting is a huge part of my year. It makes a huge difference. The digital detox is the best thing I’ve done. I started with removing facebook from my phone, which removed the endless scrolling and then no phone while watching tv! Those are great ideas…I have a few friends that removed Facebook from their phones and they said it made a huge difference. Love your multiple categories of detox — might steal those goals for myself!!! I’ve been trying to get rid of clutter a little bit at a time…out with the old, in with the new! Please do! Let me know how it goes and if you find any tricks! And YES on the out with the old! I’m trying NOT to replace it with new…hahaha, famous last words. AS a WAHM I totally need to work on myself more this year. Eating better and not working as much on social media and online. I love being home but it can be a balancing act for sure. I love my Erin Condren planner and couldn’t do with out it! I would love to go to a conference, but I don’t know which one would be the best for me. I need to do more research on it but if you figure one out, let me know! There seem to be so many of them (who knew!!!). This is a great list of goals. It is amazing me to me that we forget that we can set rules for ourselves and our own boundaries with habits. It’s so easy to get caught up in the routine and hustle of day to day life. Good to get a big picture of things. this is perfect way to start off the new year. we need to take a minute and reflect on what will make us better in the new year. I totally agree! Happy New Year! Thanks so much for the shout out! I hope that you like the one line a day journal. I’ve really loved how easy it is on a daily basis but how meaningful it can be over time. Happy Holidays! You are welcome! Your post really resonated with me so I ordered one for me and one for my best friend. Can’t wait to see what it develops into! Reducing my sugar intake was the most difficult diet change I’ve every made. And I had to go gluten-free. so I’ve had challenges. But getting to the other side with sugar was so amazing and I felt so much better. So I wish you luck with that one. I want to volunteer more in 2018, as well as reach out more to the people in my life. Those are things I’ve wanted for a while, so I ‘m ready to put them into action. Ah yeah sugar…my nemesis. I’m ready though, been thinking about it a long time. But gluten free too, that would be so hard. Although, totally off topic but have you had the gluten free Against The Grain frozen pizza’s? They are our absolute favorite pizza and we’re not even gluten free. Good luck with your goals – sometimes the outreach can be difficult, I did that last year and it forced me out of my comfort zone a lot. My goal setting for the new year is really centered on building my business and continuing to grow the new relationships I put in place this last year. Cheers to a great 2018! I need to change my mindframe to business building too. I told my husband I was going to delete Facebook from my phone and he said “but you have a business to build!” Cheers to that in 2018! I often times find myself wishing i could be a sahm. With three jobs and a three year old to raise alone it would be a hard task. Glad you are able to knock out your goals with these great practices! You have a full plate! I had never planned to be a SAHM either but it’s just how life changed in the last year that made it possible, for now. I just love all of these goals and may incorporate them into my 2018 resolutions! Thanks! Let me know if you do! Would love to have others to keep track with and share ideas. Being a SAHM is not easy and setting goals is even harder. I feel like I always need an extra push for whatever reason. Me too! I’m hoping this is the motivation that I need. At least the accountability. It is like you read my mind. I am a WAHM – my kids are in school all day. A lot of these goals will apply to me as well. Come January I am going to be planning out my work day much differently so I can get some house work done while the kids are gone as well. Being a WAHM is SO hard! I admire that, it takes a lot of coordinating and time management regardless of the age of your kids! I kind of stopped writing down my goals a few years ago. I still have them but seem to keep them locked in the vault. I think getting back into the SMART practice might be a better way to hold myself accountable and see what I’ve accomplished. I always tell people that being a SAHM has very little to do with simply staying at home. For me making lists that I can actually count and check off as done is definitely a great way to be sure I get things done. That is so right! I live and die by my lists and love the feeling of accomplishment when they are crossed off items. Helps my visual brain! Working from home makes it almost impossible to set screen time limits for myself. I definitely do need to be better about setting my mobile devices aside and enjoying time with my family. I can’t imagine trying to work from home full or even part time. Right now I only get “work” done when the are sleeping. Thank you! There’s always something right??? I think so many sahm women forget to do this. It’s so important and can make things much easier. Ahhh thank you so much! Cheers to a great 2018!